It was a big night for Warner Bros. Television and DC Comics in Hall H at Comic-Con tonight, and that certainly applies to Arrow, as evidenced by the above preview, which was screened at the Night of DC Entertainment at SDCC, and may look familiar to those who’ve already seen the previously released ArrowSeason 3 tease, until you get to about 2:31 and the video keeps going, adding on more than half a minute to reveal the villain of the third season: Ra’s al Ghul. 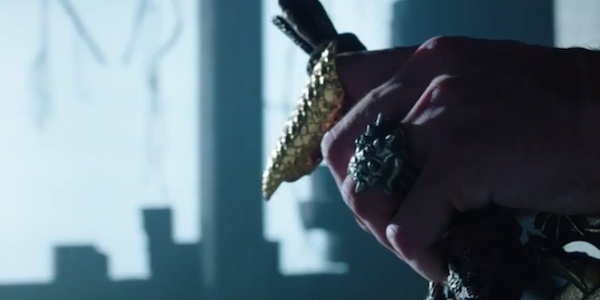 Using soundbites from past episodes, the Ra’s al Ghul tease reminds us that this is a familiar name within the series. Now it looks like we’ll be getting to put a face sword and hand to that name. When we spoke to the Arrow cast and writers today at Comic-Con, David Ramsay mentioned that this season’s villain would put Oliver's team’s whole philosophy to the test, “In terms of this whole, we’re not going to kill, we’re going to do it the right way. All of that will be challenged this season," Ramsay teased. It'll certainly be exciting to see that demonstrated and what kind of impact this character has on Oliver and his team. The preview video also teases Brandon Routh’s character Ray Palmer, and a glimpse of Colton Haynes in the Arsenal costume. Does anyone else wish it was October yet? As the preview reminds us, Arrow returns for its “epic third season” on October 8. WBTV also showed off their themed logos for their upcoming new series, Gotham (airing on Fox) and The Flash (airing on the CW). Check those videos out after the jump!